At family-owned and -operated J&J Vinyl Fence, we have over three decades of experience constructing and installing stunning, vinyl picket fencing for thousands of residential and commercial clients throughout Los Angeles. Our vinyl fences are custom-built for each customer, beautifully crafted, and backed by transferrable lifetime warranties. Additionally, our competitively priced vinyl picket fences require no maintenance: They will never rust, flake, fade, blister, or warp. Simply give us an overview of the type of design and functionality you'd like from your vinyl picket fence, and we'll build it to your complete satisfaction. Our premium vinyl picket fencing comes in an array of styles, including traditional, contemporary, scalloped, non-scalloped, and more, and can also feature one of our popular post-cap designs, such as pyramid, gothic, New England, solar with lighting, ball post, federation, and more. These fences come in white, tan, or wood-grain finishes, protected by SolarGuardTM to ensure your fence retains it vibrant color and like-new appearance. With our diverse choice in styles, colors, gates, and privacy features, we offer endless possibilities for your custom vinyl picket fence that will exceed your expectations. 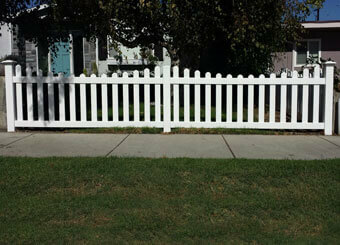 J&J Vinyl Fence is looking forward to realizing your commercial or residential fencing vision. Call today to start working with a vinyl fence specialist who will help you to determine the best picket fence design for your property, taking into account your desired level of privacy, the site's topography, and the color and look of your home or business. We are licensed, bonded, and insured, and because all jobs are owner supervised, we can ensure exceptional quality control. We offer free consultations and 10% discounts to first-time customers!